For those in the car audio game these days, it's all about linking the unit in your dashboard with the smartphone in your pocket. After all, the best phones have navigation, music and a whole host of other features incredibly useful to the average driver. Pioneer has just unveiled its second unit - the Pioneer AppRadio 2 (or SPH-DA100) - to help make this possible, with a few tricks its rivals seem to be lacking. Once fitted, the first thing you notice about the SPH-DA100 is the size of the screen – it pretty much fills the double-DIN space, with just a small bar of buttons along the bottom. The screen measures 7 inches, and is actually up from the 6.2 inch size of its predecessor – this means the digital icons look even bigger and sharper on the touch-sensitive panel once the unit is fired up. And the screen is pretty much it – nothing behind it, it doesn't move, and it is not removable for security purposes. Pioneer felt that when powered down it looks uninteresting enough for would-be thieves not to bother with. Without a smartphone connected, you can still use a couple of features, like the radio, but you need to sync up to get the full functionality. This unit handles both iPhone and Android connectivity (unlike the previous model which just handled iOS, an extra dongle is provided for Android). 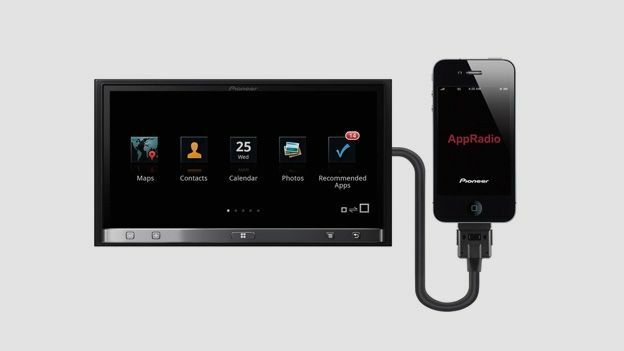 Just download the AppRadio software to your phone, and once connected it can be accessed through the touch-sensitive menus of the Pioneer device. The features of the device can be added to by whatever compatible apps are downloaded to the phone, such as Pandora - there are also different apps for adding functionality to the navigation system. But apart from that there are menus installed to help swipe and scroll through music, photos and whatever else might be stored on the phone, displayed on the Pioneer screen or played through the car speakers. The unit itself has an input for a rear-view camera, its own GPS antenna to help with navigation, and Bluetooth connectivity with an external microphone provided for taking hands-free calls. The unit will also charge whatever mobile device is connected. Operation is carried out via the touchscreen, and the device mimics the swiping/scrolling actions of many modern devices. The bonus with the SPH-DA100 is that it is the only smartphone-connecting in-car device on the market that also mimics the zoom in/out function of the iPod screen. This can be handy when using the navigation or examining a photo. Whizzing through the menus is fast and smooth, and the large colourful icons make it easy to navigate – so you don't need to take your eyes off the road for too long. The navigation will be as effective as you want it to be, based on the number of apps you install, but the menu for selecting music is quite different to that of Apple's, making it a little confusing trying to access certain songs or playlists. However, due to both Android and iPhone connectivity it's possible the software designers were looking for common ground, this being the result. Bluetooth works as expected, muting the music when a call comes through. If you can live without a CD player, and want to make it purely about integrating your smartphone and car, this is a bright, colourful and – with its touchscreen and scrolling – very slick way of achieving it. While the software interface may feel a little cumbersome at times, it does what it sets out to do, bringing navigation and music from your phone into the car.